“Nappily Ever After”, the Netflix Original, based on the novel by Trisha R. Thomas told an accurate story of a Black Woman’s relationship with her hair. Directed by Haifaa al-Mansour, this movie reminds viewers the importance of self-acceptance and that the unrealistic standard of perfection does not always provide the results you desire. In Violet’s case, perfection seriously backfired. The movie was separated into chapters reflecting Violets life stages according to her hairstyle, starting with Straightened, followed by Blonde and ending with Nappily, a chapter that showcased the versatility of Black hair. Fast forward to Violet as an adult; a successful advertising agent, slipping out of bed while boyfriend Clint (Ricky Whittle) is sleeping, to sneak her mom in at the crack of dawn to straighten her hair to keep up the illusion of perfection. Next, a mishap at her birthday lunch leads to an emergency hair appointment, resulting in chunks of her hair falling out and a long weave. During her emergency trip to the hair salon, Violet meets Zoe (Daria Johns), a strong-minded, mischievous, ten year old with natural hair, along with her single father and salon owner, Will (Lyriq Bent). Zoe’s character was a perfect example of how the next generation of Black girls are growing up loving their natural hair. Hoping for a Clint to propose, Violet is disappointed when she gets a puppy instead of a ring. So she confronts Clint. He says their two year relationship felt like one long first date, because of Violet’s constant perfection and never being her true self. After getting her heart broken, Violet gets drunk at the club and decides to to shave all her off her hair, which actress Sanaa Lathan did in one brave take. 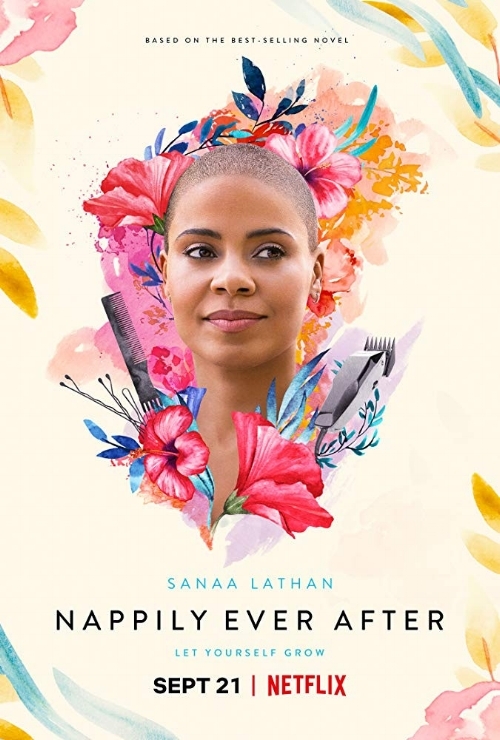 “Nappily Ever After” is advertised like a romantic-comedy, but there wasn’t much love–except for self love–or comedy. I also feel it left a lot unexplored, especially the character’s relationships. Violet’s relationship with the hair salon owner, Will (Lyriq Bent), started out rough, transitioned to light flirtation and eventually fizzled out. Violet’s relationship with her mother was also left opened ended. She finally broke free from her mom’s toxic control, but the relationship wasn’t repaired before the end. Zoe was my favorite character not only because of her honesty or bright smile, but because she led Violet’s journey of self love and taught her how to truly accept herself. Before Violet cut her hair, everywhere she went men turned their heads and fawned over her. As soon as her long silky hair was gone, the attention went too and at one point she even said that she felt ignored without hair. That change speaks to black people’s obsession with our hair and the european beauty standards that are still regarded more highly than our natural beauty. “Nappily Ever After” painted an authentic picture of how society views hair as a qualifying factor for beauty, and how damaging that can be to Black women, but they reiterated the narrative that hair equals beauty. Although this movie had great qualities and scenes, “Nappily Ever After" only scratched the surface of Women, especially Black Women being raised to obsess over looks and perfection in order to get “picked” by a man. Additionally, This film was a great reminder that in order to be our true selves we may have to analyze and unlearn ideas that were passed down and were taught to us as children. This movie also leaves us with, “Don’t let someone’s negative opinion of you become your reality.” Violet said this powerful statement to Zoe and I think it’s something we can all strive to live by. An Exclusive Interview with the Creative Geniuses Behind "The Hate U Give"